In this case study, we are going to look at the case of a worker who suffered a serious fracture to the 5th metatarsal bone on his left foot. What is a metatarsal bone? The metatarsal bones are a bone which connects the phalanges toe bones at the end of the foot, to the tarsal bones at the midfoot. Metatarsal bones can break or fracture in falls, foot crush injuries, and sports injuries. Have you have suffered a fractured or broken 5th metatarsal bone, or suffered an injury to any other bone in an accident that wasn’t your fault? If so, then you may be due compensation. If you can prove that the bone was broken due to the negligent actions of another party, which caused the accident where you were injured then you could claim thousands of pounds in compensation. Trust Legal Expert to find the personal injury solicitor with the right expertise to handle your case, and get you the compensation that you are entitled to. Call Legal Expert today for your free consultation and to see if you could make a valid personal injury claim. In this case study, we are going to look at the case of Mr J (whose name we have abbreviated for reasons of privacy) who suffered a fractured 5th metatarsal bone as the result of an accident at work. Unfortunately, Mr J, who had a technical job had to step over multiple obstructions in his workplace, which posed a serious slip, trip, and fall hazard. When walking to a machine, he tripped on a stud which was sticking out of the floor and fell. After the fall Mr J was taken to a hospital, where he showed signs of 5th metatarsal fracture symptoms. After Xrays, he was diagnosed with a fractured 5th metatarsal bone on his left foot, and a fractured right ankle, serious injuries that can have a lasting effect on the patient. A fractured or broken 5th metatarsal bone can be a very serious injury. Some broken 5th metatarsal symptoms include pain, tenderness, swelling and bruising, difficulty walking and bruising. Depending on the severity of the injury, 5th metatarsal fracture treatment options can include surgery then binding the foot with a stiff boot, or plaster to keep it straight and in place as it heals. Another 5th metatarsal fracture option can be immobilisation. How long does it take for a fifth metatarsal fracture to heal? The average fifth metatarsal fracture recovery time in between 6 – 8 weeks. As you can imagine, such an injury would have had a significant effect on Mr J’s quality of life, causing him to miss time off work, and making it harder to perform daily tasks and activities including sports, during his recovery time. After Mr J’s broken metatarsal bone accident occurred his workplace took actions to remove the risk that the stud posed to other workers. The stud that sticking out of the floor was cut so it was inline with the floor and the area was marked in yellow paint, warning others that there was an obstruction there. Adapting the workspace to reduce the risk posed by the stud can be taken as an admission of liability by the business which employed Mr J. Unfortunately, accidents in the workplace are more common than you might think. Last year 609,000 non-fatal injuries due to workplace accidents were reported. 175,000 of these injuries caused the victim to have to take a leave of absence of 7 days or more off work, as a result. Under the 1974 Health and Safety Act, workplaces have a Duty of Care to protect employees working on their premises. To be in line with health and safety regulations, businesses are supposed to conduct regular risk assessments hazards that can cause harm to a member of staff, customer or another member of the public on their premises. Businesses that fail to follow these simple steps stand to miss out on days when their employees are fit and healthy enough to work, have to pay compensation and what’s more become less ethical businesses because they are willing to put their staff at risk. In the long term, cutting corners is never worth it. 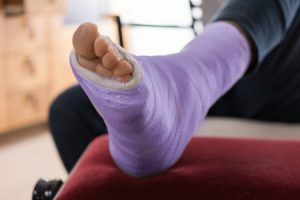 For his broken 5th metatarsal bone injury, Mr J sought legal help from a personal injury solicitor, to fight his case for personal injury compensation for him. Due to the ongoing symptoms that Mr J, the Claimant suffered, he had to be assessed by a medical expert on two separate occasions. During this time his solicitor managed to recover the earnings Mr J had lost as a result of his accident at work. As the case proceeded Mr J’s employer, the Defendant admitted liability for the Claimant’s accident at work, which caused a 5th metatarsal bone fracture. As a result, Mr J was awarded £23,000 for his injury. Has the negative actions of an employer, or someone else caused you to suffer a fractured or broken 5th metatarsal? You can choose to use no win no fee solicitors to fight your compensation claim for you. No win no fee solicitors are, for many, a less stressful option. With no win no fee, you only pay your solicitor’s fee if you win your claim. Legal Expert works with some fantastic personal injury solicitors that offer a no win no fee service. Call us today to speak to one of our friendly advisors about your case. Has an accident that wasn’t your fault left you with a broken 5th metatarsal bone, fractured metatarsal or metatarsal foot pain? Trust us, Legal Expert to help you claim compensation to cover the costs of your 5th metatarsal fracture treatment options and for your pain, suffering and loss of amenity. If someone else was responsible for your accident, hold them accountable! Call Legal Expert on 0800 073 8804 today and one of our friendly advisors will let you know if you have a genuine case for compensation, advise you on how much compensation you could claim and match you with a personal injury solicitor who can take on your case. How Much Compensation For A Foot Injury? Help and advice for claimants involved in an accident which left them with a foot injury, including a toe injury. Advice for claiming compensation for a broken toe, broken big toe and other foot injuries. Accident At Work How Much Compensation Can I Claim? Find out the compensation amounts you can claim for an accident at work.